We are all aware of the fringe right wing attempts to suppress votes in this nation. They say it’s to protect the integrity of the election process to fight back the .0000000000003% incidents of nationwide voter fraud. They say that requiring valid ID to vote isn’t an impediment. In of itself that may be true; however imposing certain ID from the Voter ID advocates (from Koch Brothers sponsored ALEC by the way) disproportionately impedes certain classes of people from being able to satisfy the requirement. Studies have clearly shown that these laws impact minorities, students, elderly and women, who coincidently tend to vote more moderate and liberal than those who advocate the IDs. In some jurisdictions a conceal carry license is sufficient but not a University Student ID. Incidentally it’s easier to get a conceal carry license than a University Student ID. The elderly and poor who do not or cannot drive aren’t likely to have drivers licenses. So of course they would be unable to drive to the few places in states like Texas where they can get a license anyway let alone be able to pay for it. While speaking of Texas, their voter ID laws makes it very difficult for women who just may have a different last name from when they were born from being able to vote. Some of the ID requirements advocated requires indigent poor people to come up with money they don’t have to get birth certificates. This is in effect a poll tax already declared to be unconstitutional by the Supreme Court. As we all know, these voter ID laws results in true election fraud in this nation in a transparent attempt to suppress the votes for any classification of voter who isn’t inclined to vote what is termed (mind you) a conservative right wing agenda. However, it doesn’t end there. The GOP, using their wins in 2010 have gerrymandered districts to favor them in all races until the next Census in 2020. In a 5-4 decision the Conservative leaning Supreme Court (with Scalia, Thomas and Roberts catered to by Koch sponsored right wing groups) overturned key proponents of the Voting Rights Act allowing unchecked new laws to be imposed to keep certain “other” people from being able to vote. As a result, these people are left with no recourse until after the election when it’s too late. Efforts are underway by the Justice Department to try to fix these blatant attempts to keep the majority voice from being heard in both local and national elections. There remains “Get out the Vote” activities working on the theory that the more that show up, (those who normally sit out elections) who show up will counter efforts of the minority right wing fringe. However, while this is going on, there is this group that comes from Houston who has and continues to organize to thwart those efforts. They are called “True the Vote” and they are the focus of this rant. They are a Tea Party off shoot formed in 2009 in Houston. They are sponsored by the Koch Brother’s front group known as Americans for Prosperity. They try to organize nationwide to get their own “poll watchers” to show up and challenge those they think shouldn’t be voting. They have no formal affiliation with local government, they are a civilian force. By that, they are the same as Tea Party militia type like The Oathkeepers. They see only one kind of American, usually white and “conservative” (by their warped definition of conservative versus liberal). In reality they are supportive of the oligarchic regime that their financial benefactors are working to establish via groups like American for Prosperity, The Heritage Foundation, Tea Party Express, The Oathkeepers; and their backers, Charles and David Koch and their 1% allies. Working from a false premise of voter fraud, they send over “poll watchers” to intimidate people they deem as “suspicious” from voting. Who do these people tend to be? They tend to be minorities of course. True the Vote were recently active in Mississippi at the request of ultra right wing neo confederate and sore loser Chris McDaniel, because of Thad Cochran making approaches to the Black Voters in Mississippi to support him. Fortunately they failed to keep enough from the polls, but they haven’t given up and promise to be very active in November 2014 to suppress the “other” vote from being heard. Of interest is that True the Vote was one of the groups alleged to have been under scrutiny by the IRS over their tax exempt status. They still have their tax exempt status though no one can clearly identify the social service they provide to the community at large. Seems to me that voter harassment and intimidation is more of a social disservice to the community, but what do I and over 70% of the nation know anyhow? 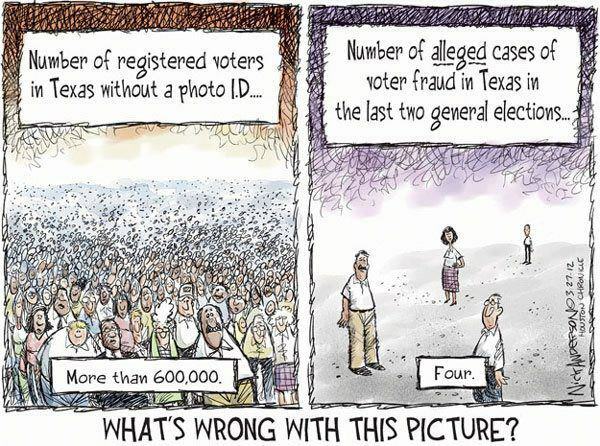 True the Vote claim that Voter ID laws actually increased voter turnout in the states affected. Upon review of their research methodology it was shown that they were, of course lying. In reality, all but one state with new Voter ID laws ended up with lower voter turnout (which is their goal) on average of 3.8%. In a close, low turnout election, that can make a huge difference on outcomes. Their methodology as “poll watchers” is to follow voters to the polling places, take their pictures, confront them on their legitimacy, and intimidate and harass them so they simply don’t follow through with voting. Keep in mind the “True the Vote” poll watchers have absolutely zero legal authority to stop anyone from exercising their rights to vote. So how best to confront these people if you encounter them at your place of voting? If local law enforcement threaten you over you exercising your right to expose “True the Vote” let them know you will be contacting the FBI and Department of Justice over their actions. True the Vote is a sham organization and by you simply using their tactics against legitimate voters on these voter intimidators, you have the upper hand and the rule of law behind you. Despite the best efforts of Republicans in both Federal and State governments, there is absolutely no “voter fraud” out there, certainly nowhere near enough to impact any election. If those on the right truly valued individual rights of all Americans, they would respect everyone’s right to cast a vote without fear of intimidation and harassment. I have no problem with them voting their belief system; they should have no problem with the rest of us voting ours. There is no voter fraud in this nation, only election fraud via easily hacked voting machines, corrupt partisan officials at offices charged with tallying the votes, voter caging and other voter suppression methods. That is how election results are negatively impacted to not reflect the will of the majority of the people, not a handful of individuals over a 12 year span of time caught not being legally registered to vote trying to vote. That impact is infinitesimal and it’s an insult to use that to justify infringing on anyone’s right to vote. For that, there should be clear and quick justice. Those people are the ones who need to be identified, charged and prosecuted in Court, not ordinary Americans trying to vote their conscience. Get registered, get educated, get motivated and vote the entire ballot of each and every election. That is your duty as an American citizen.